Folding-bike brand Brompton Bicycle sanctions an annual U.S. Championship, and this year it was held in GearJunkie’s home town of Minneapolis today, June 23. 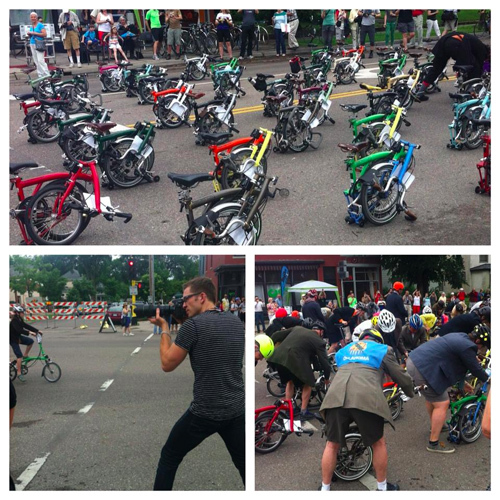 A 6-mile race, the event starts with a Le Mans-style foot sprint to a pack of bikes folded up — racers run to their Brompton bike and flip the handlebars, secure the frame, and flick the wheels into place before jumping on for laps on a closed street in Minneapolis. Area bike shop Calhoun Cycle organized the event this year. It also corresponded with a Minneapolis initiative called Open Streets, which kicks cars off city streets for a day of biking and pedestrian-only fun. GearJunkie editor Stephen Regenold competed in the U.S. Championship at the last minute… and he won! Regenold had never ridden a Brompton before the race morning. But he got the unfold procedure down before toeing the starting line. Dressed in the required suit coat and tie — not to mention a Giro Air Attack aero helmet! — Regenold took an early lead and never looked back. He pedaled in the lead pack for five laps before darting ahead after the final course turn to sprint two blocks to the win. To be sure, the competition during this race was 90% in the “fun” category. Only a small pack at the front were competing. 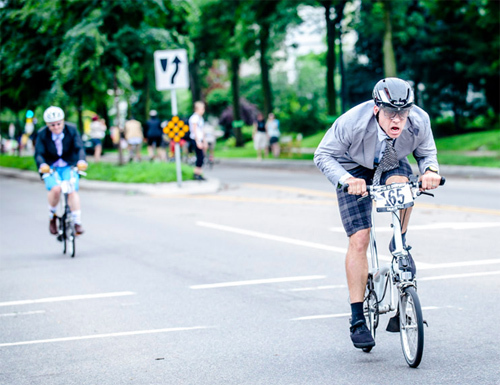 But those serious Brompton racers were putting out a hard effort, their suit coats soaking through with sweat within a lap or two. 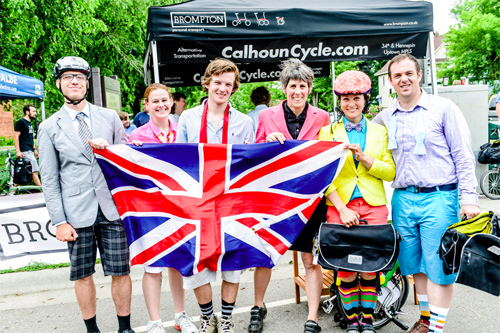 Brompton bike owners traveled from around the country to compete. 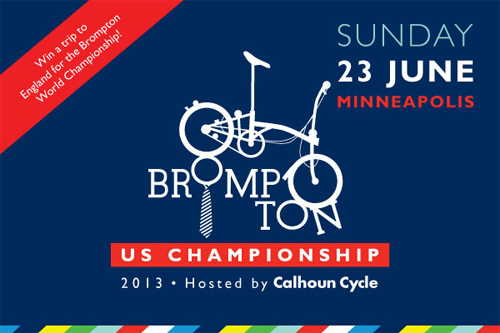 At stake was the U.S. Champion title and a trip to England for the Brompton World Championships in July. More than 50 racers competed. 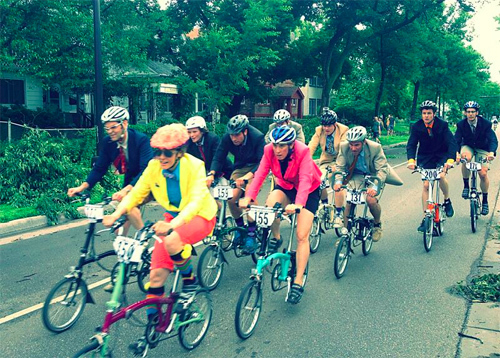 As is the Brompton aesthetic, all racers were required to dress up. The organizers awarded for “best dressed” as well as speed. 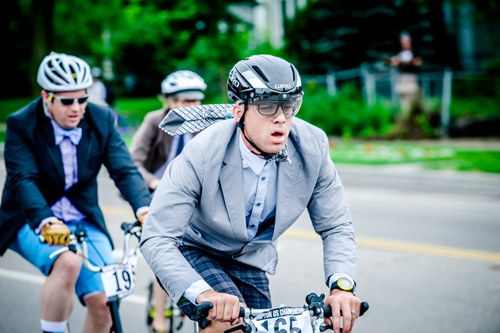 With his visor-equipped aero helmet, plaid shorts, Chrome bike shoes, and a stripe tie, Regenold was perhaps too clashing for the best-dressed prize. He was happy with the race win instead. “Those little bikes are fast,” he noted, hoisting his winning stead — unfolded — up in the air near the podium. The crowd of fold-up bike fanatics applauded the competitors, including the distance course racers, the fold-up-your-bike contest winners, and, of course, the dapper men and women winners who out-dressed the rest.